Michigan did it again Tuesday night, as the Wolverines once again fell victim to an unheralded foe at home. Eastern Michigan knocked off John Beilein’s team, 45-42, and offensive woes were the culprit in this one after issues on the defensive end caused the loss to NJIT on Saturday. Michigan shot 4-of-21 from the three-point line against EMU’s zone, and put up a pedestrian 0.70 points per possession as a result. They also turned the ball over 13 times, and now, after notching good wins against Oregon and Syracuse, Michigans has two pretty bad losses on its resume that could burn it come NCAA Tournament time. 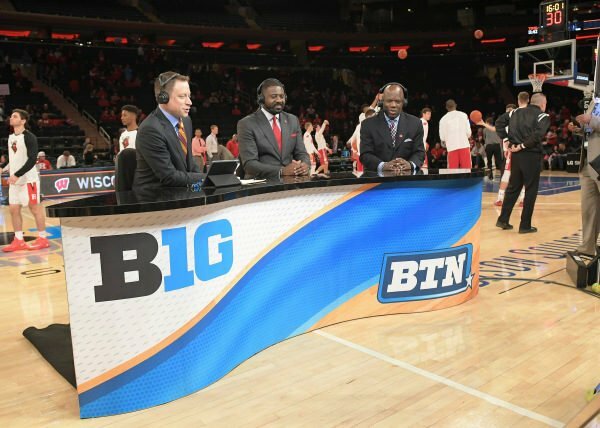 Speaking of tournaments, it was announced earlier this week that the Big Ten will hold its conference tournament in New York City’s Madison Square Garden in 2018. After firmly planting its flag on the East Coast with the additions of Maryland and Rutgers this season, the league’s new foothold along the coast got much stronger with plans to hold its postseason showcase at the Mecca of college basketball. One interesting note about how things will play out is that the tourney will be held a week early to accommodate a pre-existing agreement that MSG has with the Big East. That means conference play will need to start a week earlier during the 2017-18 season in order to have the postseason tournament a week before the rest of the other power conferences. Want to find a holiday gift for the Michigan hater in your life? Look no further than the NJIT bookstore. Management of the retail outlet says that the bookstore has been “flooded” with calls from fans of Michigan State, Ohio State, and Indiana looking for some NJIT gear to poke fun at the Michigan fans in their lives. “Typically on a Monday morning we’ll come in and have four or five orders, if that many, and this Monday we had 90,” said manager Pete Maranzano. No word yet on what will happen at the Eastern Michigan bookstore on Wednesday morning. Purdue made a lineup change on Monday night by putting freshmen Isaac Haas and PJ Thompson in the starting five in place of AJ Hammons and Kendall Stephens. The move seemed to work well, as both Hammons and Stephens had productive games with the change. Hammons put up a double-double with 13 points and 12 rebounds, while Stephens also produced 13 points from the bench. It remains to be seen whether head coach Matt Painter will stick with that lineup, but given Purdue’s depth, tweaking the lineup to get more out of his players remains an option should he choose to tinker for right combinations. Minnesota is down to just nine scholarship players after freshman forward Josh Martin decided to leave the program, as the athletic freshman struggled to earn minutes behind Joey King and Charles Buggs at the power forward spot. Martin was only averaging 5.4 MPG through seven games, contributing 1.3 PPG and 1.0 RPG in his little time on the floor. As Minnesota presses more than it did last season, the loss of Martin could harm its depth should King and Buggs get into foul trouble. The team has to hope that freshman Gaston Diedhiou is cleared to return in January after experiencing some problems gaining admission to the school. Today we will look at some of the most interesting ACC non-conference games of 2013-14. For this feature we will not include games in early season tournaments because we earlier previewed those events in three parts – Part I, Part II, and Part III. Also, we will not look at any of the specific match-ups in the ACC/Big Ten Challenge in this feature because we’ll focus on that annual event at a later date. That still leaves a good inventory of ACC-related non-conference games to choose from, and as you will see, most of these games will be played in New York City, which is not entirely by accident. Counting tournament appearances, eight different ACC teams are scheduled to play a total of 16 games in the Big Apple — it’s obvious that the ACC is serious about taking advantage of the most recent expansion into the Northeast. A strong presence in New York is clearly part of the conference plan. By comparison, only four ACC teams played a total of five games in the New York area last season, counting a Duke-Temple game played in East Rutherford, New Jersey. In chronological order, here are the seven non-conference games that will be crucial to win for the ACC to meet its goal as the top conference in the nation this season. Without injured point guard Seth Allen, the Terrapins will be underdogs against the Huskies on opening night. The explosive Connecticut backcourt of Shabazz Napier and Ryan Boatwright will be hard covers for the bigger but slower Maryland guards. 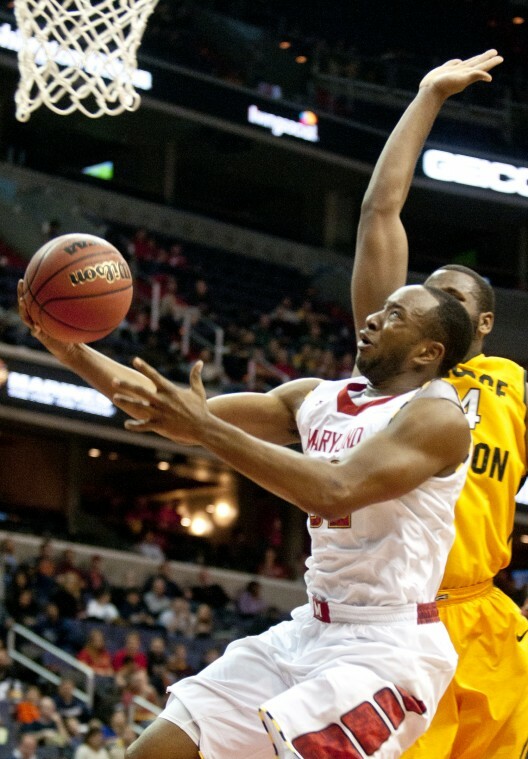 Dez Wells and Nick Faust must limit their turnovers, a problem for both last season, but the Terps hope to counter with the punishing post duo of Charles Mitchell and Shaquille Cleare. A wild card for Maryland may be 6’8″ sophomore Jake Layman, who reportedly has been a standout in preseason scrimmages. The college basketball world will be focused on the Champions Classic doubleheader on this night. #1 Kentucky squares off with #2 Michigan State in the opener, but most of the buzz seems to be about the nightcap. There are plenty of storylines for this one including the match-up of the top two freshmen in the country, Andrew Wiggins of Kansas and Jabari Parker for Duke. Also, the game is in Chicago, Coach K’s hometown, and the Midwestern backyard of Bill Self. This year’s #1 high school senior Jahlil Okafor lives in Chicago and reportedly will decide soon between Duke and Kansas. Finally, it should be a great game to watch with plenty of top athletes on the floor. Kansas holds a decided edge in the paint while Duke has a more proven backcourt. The game may come down to which team’s newcomers best handle playing on the big stage for the first time. We mentioned in this space yesterday that Jahii Carson along with Marcus Smart were not only two of the best point guards in college basketball, but that they are also both rising sophomores who have already publicly stated that next season will be their last in the amateur ranks. Both players are likely to have All-America campaigns ahead of them, but Smart in particular is on everyone’s short list as a NPOY candidate, and with good reason. The latest published results of a poll of coaches from CBSSports.com staff shows that Smart is the most coveted player in all of the land, coming in with a bit more than one-third of the vote (34%). Next on the list was Creighton superstar Doug McDermott (24%), followed by wunderkind Andrew Wiggins at Kansas (15%). A number of other players received votes, including Ohio State’s Aaron Craft, Michigan’s Mitch McGary and Syracuse’s CJ Fair, but the naming of five other freshmen after Wiggins reveals just how strong this year’s incoming class is perceived to be. One notable omission from the list was Louisville’s Russ Smith (his teammate Montrezl Harrell actually received a vote instead), but as the article notes, the choices make clear that coaches value experience and sustained leadership over unproven (or sometimes unstable) commodities. While all this conjecture is great, it’s ultimately meaningless until we start the games in November. And what about those games, the reason we all watch these players in the first place? Wednesday was a good day for folks like us — fans of the sport who like to have concrete games on the schedule to sink our teeth into. ESPN released its Big Monday lineup for 2013-14, and the most notable thing about the 16-game set over eight weeks is that the new slot of ACC games at 7:00 PM ET considerably resembles vintage Big East offerings. The Big 12 still carries the 9:00 PM slot (Andrew Wiggins, anyone? Kansas is involved in half of the broadcasts), but half of the ACC Big Monday games will involve teams who were still Big East entities as recently as 40 days ago. One game in particular — Notre Dame vs. Syracuse on February 3 — comes straight from the old Big East rivalry playbook. Welcome to the new ACC, indeed. Now can we get a west coast flavor at Midnight ET to sweeten the deal even further, like we used to have with the Big West and UNLV slotted there once upon a time? Some other interesting scheduling news hit on Wednesday surrounding the build-up and planning for Super Bowl XLVIII in New York City, as it appears there will be a basketball extravaganza at the World’s Most Famous Arena on the Saturday before the NFL’s title bout. Madison Square Garden, in partnership with Fox Sports 1, will host a hoops triple-header to give people in town for the football game a little something to feast on beforehand. St. John’s will play an as-yet-undetermined Big East opponent in the early afternoon slot (Marquette is rumored to be that team), followed by a blockbuster Georgetown-Michigan State match-up in the late afternoon, and capped off with an NBA tilt between the Knicks and the Miami Heat in the evening. It’s an impressive lineup, for certain, and is suggestive that programmers of college basketball really need to learn to capitalize on those empty weekends starting in late January and through to mid-March… before March Madness hits in earnest and captures the attention of everyone else. Is it too early to already be looking forward to games the following season? We’re talking about 2014-15 here, but hey, it’s a light news cycle. It’s always, always, always a good thing when top 10 programs meet in non-conference match-ups during the regular season, and it appears we’re going to have a good one when regional rivals Louisville and Indiana will face off in the Jimmy V Classic on December 9, 2014. Although the two rosters are likely to look considerably different than they do even this coming season, both Tom Crean and Rick Pitino are recruiting so well that you can count on this being a fantastic game. Even if it won’t tip off until some 16 months from now. It must have been Pac-12 preview Wednesday around the interwebs yesterday, as both ESPN.com and SI.com featured the much-maligned basketball league with a summer update post. The WWL’s piece is more comprehensive in scope, but Andy Glockner’s writeup is the better read. They both have high hopes for Sean Miller’s Arizona Wildcats, while agreeing that the league as a whole is once again on the uptick after a period from 2010-12 that was as bad as many have ever seen. There’s a lot of good information in both pieces, though, so we suggest that you check it out lest you find yourself come November wondering why the league has three or maybe even four teams ranked in the preseason AP poll. Brian Otskey (@botskey) filed this report from Louisville’s second consecutive Big East championship game victory on Saturday night at Madison Square Garden. Two words: Pressure defense. Louisville turned a 45-29 deficit into a 78-61 victory over the last 16 minutes of the game. The 49-16 run to close the contest was one of the more impressive feats I’ve seen in my years watching college basketball. After a few turnovers, it was clear Syracuse was rattled by the relentless Louisville pressure. 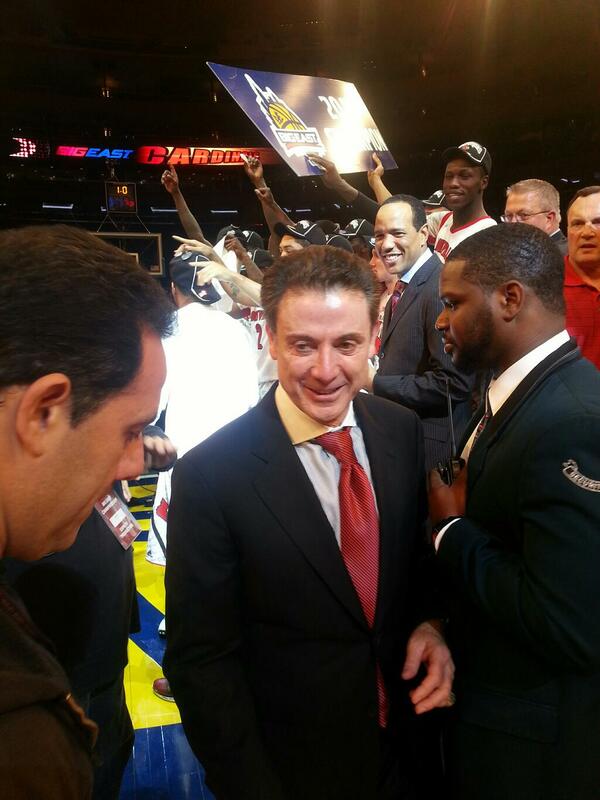 It’s Rick Pitino’s calling card and it came through when the Cards needed it most. Louisville was awful defensively in the first half and that continued out of halftime as Syracuse hit four of its first five shots out of the locker room. That’s when everything (and I mean EVERYTHING) changed. Syracuse made just one field goal over the next 14 minutes as Louisville ran away with the game. People talk about VCU’s havoc defense but there is no team in the country that pressures the ball as hard and as efficiently as Louisville. Syracuse got flustered. Even while playing in front of a decidedly pro-Orange crowd (75-80%), Syracuse let the suffocating pressure get to them in the worst way. Nobody was more affected that Michael Carter-Williams, who until midway through the second half had played one of the finest games of his young career. Carter-Williams’ body language went south and his play suffered, culminating in a flagrant one foul call that was likely the result of pent-up frustration. The Orange were never able to regroup despite the partisan Madison Square Garden crowd and Louisville simply took it to them over the balance of the game. Louisville adjusted its offense and Syracuse failed to do the same defensively. Pitino’s team shot a robust 53% overall in the second half, including an impressive 12-of-19 shooting mark from inside the arc. Louisville worked the ball inside all second half against a Syracuse zone that had been extended out what seemed to be a good five to eight feet away from the basket all night. Louisville probed the high post and dumped it down low successfully with Montrezl Harrell turning out to be the main beneficiary of those sets. Syracuse never adjusted its defense, never more so exemplified by Kevin Ware’s baseline cruise and dunk with 8:24 to play that put Louisville up by nine points. Star of the Game: Freshman Montrezl Harrell scored 14 of his career-high 20 points in the second half. It was a coming-out party for one of the better freshmen in the nation, someone who will make plenty of breakout player lists in 2013-14. Harrell, a former Virginia Tech commitment, had his way operating along the baseline and attacked the rim at will as the Syracuse back line defenders were helpless to stop him. This kid has the skill, athleticism and motor needed to excel at this level and will be a star in the years to come for Louisville and likely at the next level as well. Brian Otskey (@botskey) filed this report from Syracuse’s overtime victory over rival Georgetown in Friday night’s Big East semifinal at Madison Square Garden. James Southerland and Trevor Cooney opened up Syracuse’s offense. Syracuse did most of its damage in the first half of this game thanks to Southerland’s continued hot shooting and Cooney’s surprising contribution off the bench. Southerland scored all 13 of his points in the first 24 minutes of the game (more on that next), not an unexpected performance from a guy who has been on fire all week. His four triples gave him 16 for the week, tying Gerry McNamara’s record from 2006. But it was Cooney who really energized the Orange in the first half. The seldom-used sophomore out of Delaware came off the bench and poured in 10 points, all before halftime. The outside success of these two players opened up a lot inside for Syracuse, a team that doesn’t look there all too often. Baye Keita had arguably his best game of the season with a lot of his production coming via the offensive glass. With Georgetown having to respect the Orange on the perimeter, it gave Keita more space to get in position for rebounds and scores. Even though Southerland and Cooney almost didn’t score at all in the second half and overtime, their success in the first half enabled Syracuse to hang on. Jabril Trawick’s defense on Southerland allowed Georgetown to come back. Trawick, known as Georgetown’s best defender, completely locked up the hot-shooting Southerland for the final 16 minutes of regulation and the five minute overtime, holding the Syracuse senior sharpshooter to just two field goal attempts over the final 21 minutes of action. As a team, Georgetown held Syracuse to just 28% shooting in the second frame, allowing the Hoyas to slowly chip away at the lead as regulation winded down. Georgetown made some clutch shots and free throws but team defense (and Trawick specifically) was the main reason why the Hoyas were able to force overtime. 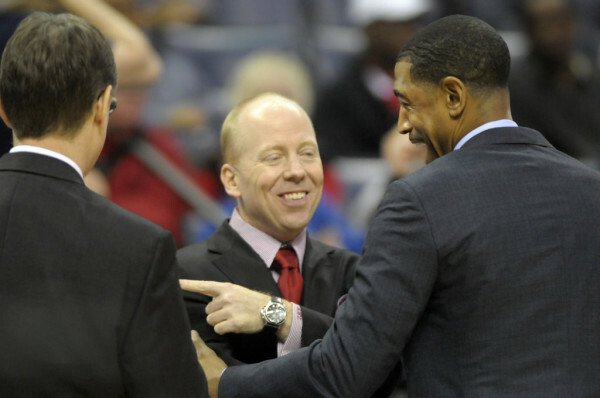 It was a fitting end to a classic Big East old guard rivalry. It’s sad that this all had to come to an end. These two teams put on a show for the 20,000+ fans gathered in Madison Square Garden on this semifinal Friday night and it seemed that nobody wanted this game to end. There will be a lot written about this in the days and weeks to come but this game will be a treasured memory for everyone in attendance, one that nobody will soon forget. 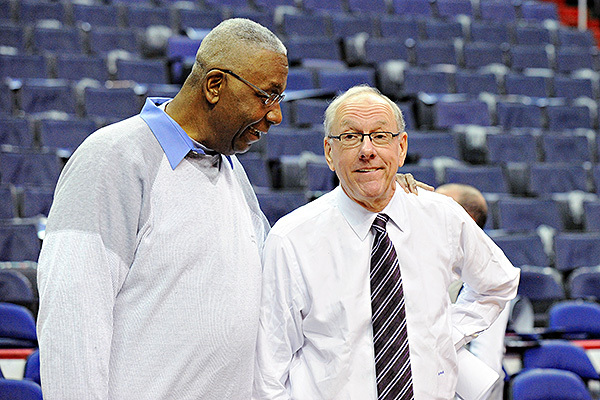 We were all incredibly lucky to witness one final classic between two founding members of the original Big East.